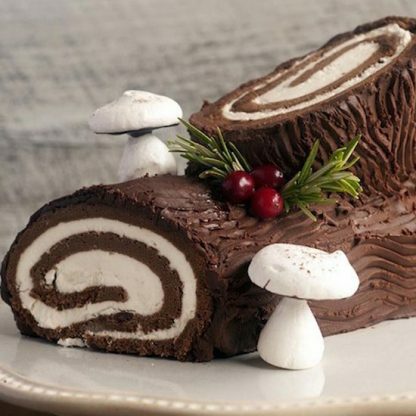 Small Yule Log with Vanilla cake. We create a rich Vanilla sponge cake and frost it with your choice of a buttercream filling in Chocolate, Mocha, or Raspberry. It’s then rolled up like a cinnamon roll and layered with rich chocolate icing. This is our small Yule Log with Vanilla cake. Choose your filling.